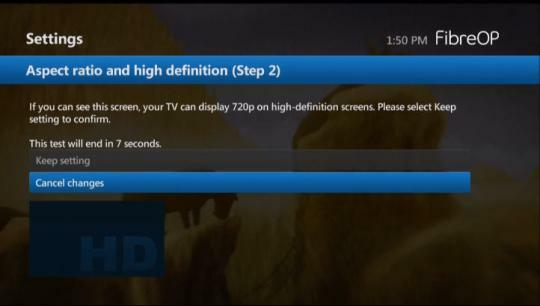 We recommend that you set your receiver to the highest resolution that your TV can display. Press the MENU button on the Fibe TV remote. The Menu screen appears. Your remote may look different. 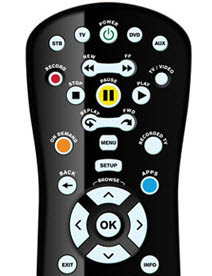 To see all remotes, view our Learn what the buttons on my Fibe remote do article. Press the down-arrow button on the remote to scroll to Audio and visual. Use your right-arrow button to TV resolution. Press the OK button on your remote. Use the right-arrow button on the remote to scroll over to the resolution options. Use the down-arrow button on the remote to select the highest resolution setting that your TV can display. 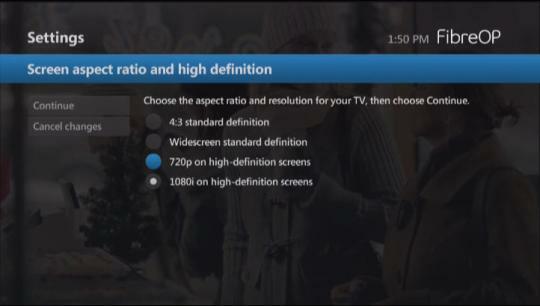 If you are not sure of your TV resolution, select the highest resolution (Either 1080i or 1080p will appear in the resolution options, depending on your receiver). The receiver will perform a test to ensure your TV can display that resolution. Press the OK button on the remote. Press the OK button on the remote to continue. The Aspect ratio and high definition start-test screen appears. Select Start Test and press the OK button on the remote. Note: This test checks that your TV is capable of displaying the selected resolution. It will take approximately 15 seconds and the screen may turn black during this time. If you are able to display the selected resolution, a screen will appear to confirm this. 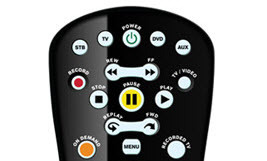 Use your down-arrow to scroll to Keep Setting and press the OK button on the remote. Note: To change your resolution setting you must select Keep Setting within the 15 second test-time. If your TV is unable to display the selected resolution or if you take longer than 15 seconds to select Keep Settings, you will see the following screen. I saw a black screen. Choose another setting. : Select this option if you saw a black screen during the test. This indicates that your TV is not able to display the selected resolution. You will have the option to select a new resolution and then test it. Start test again: Select this option if you took longer than 15 seconds to select the Keep Settings option. The test will run again for the resolution that you last-selected.